An engaging, maintainable, user-friendly website is the foundation for long-term success. Economic development and tourism organizations have hired our firm to create highly-customized, award-websites that appeal to a wide-range of audiences. Your website is an extension of your community’s strengths and personality. We understand that every community is different, and competition to attract and retain business is tougher than ever. You have a story to tell that is unique from every other community in the world. 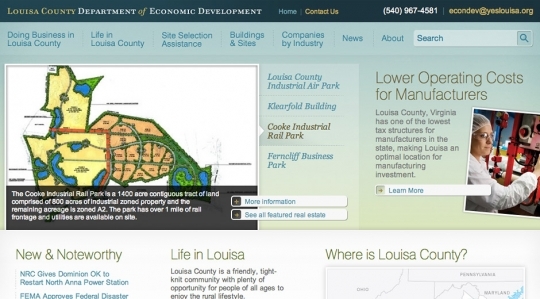 With GIS mapping, detailed information on featured sites and a mobile-enabled website, Louisa County Virginia is poised to attract economic development prospects.